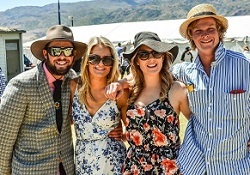 Join the excitement at Cromwell Christmas at the Races! There's plenty to keep everyone entertained throughout the day, including thrilling racing action, live music, and a range of delicious catering options. 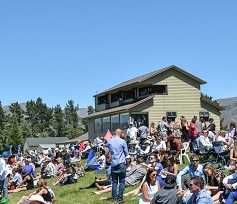 Impress your friends, family or colleagues by booking a hospitality package at one of New Zealand's most beautiful racecourses. Set on the finishing straight with sweeping views of the course and winning post, enjoy the great atmosphere of the Tinseltown. This village is perfect for getting a group of mates together or hosting clients in your own private marquee. The big screen in front of the village will ensure you don’t miss any of the action around the track and with live music this is sure to be the best marquee spot on course. *This is a strictly ticketed village. Each village will have their own TAB & Bar Facilities with the option to pre-order your beverages at a reduced rate. Coming to the races with your mates and want to be part of the exclusive action in Christmas Cheer Village then join in the action from the Jingle Bell Rock Enclosure. This ticket includes beverage on arrival, race book and 2 course buffet lunch from our on course caterer with easy access to TAB and bar facilities. 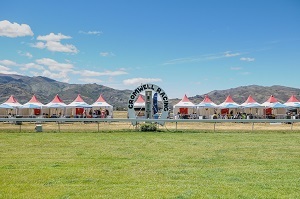 This enclosure is sure to provide race goers with a truly memorable experience for the Cromwell Christmas at the Races. See all the horses as they round the bend and come along the finishing straight. 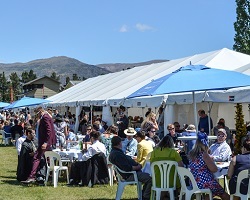 The Christmas Cheer Village is another great option to host clients or come along to the races with your friends and enjoy the surroundings of your own private marquee. Looking for something smaller but don’t want to miss out on the racing? Purchase a marquee on the inside of the track! Marquees include tickets for 10 people, 10 race books, table and 10 chairs, TAB and bar facilities on the inside of the course. Get the closest spot to the finishing post, limited spots available. * This is a strictly ticketed village. Centre Course Marquees will have their own TAB & Bar Facilities with the option to pre-order your beverages at a reduced rate. $20 – Under 16 Free. 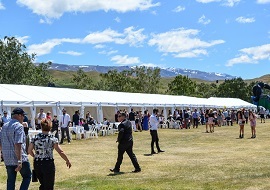 What can be better than a day of quality country racing on a summers day sitting on the lawn in Cromwell? * This event is strictly NO BYO. All ticket prices are GST inclusive.